The Control Charts Main List screen displays Control Chart information currently defined in the system. When you access this screen, the system prompts you to filter the Control Charts using the Control Chart Main Filter window. You can click OK in the filter to bring back all records (“Cancel” brings back zero records). Or you can enter any filter criteria into the fields of the “Filter By” and/or “Order By” areas to filter the results, then click OK . The system displays the results in the Control Charts Main List screen. On the Control Chart Main List screen, click a Specimen. The system displays the sample details on a new screen. Click the Forward button to view the next sample, or click Done. Note: Delete button may display, but is disabled. Export function is better suited to multiple sample data. To export Control Chart data to Excel, click the Export button from the Control Chart Main List screen. On the Control Chart Main List screen, select the data samples for which you wish to calculate statistics. You may also click Select All . Click Calculate. The system displays the statistical data in the fields above the Control Chart Main List. 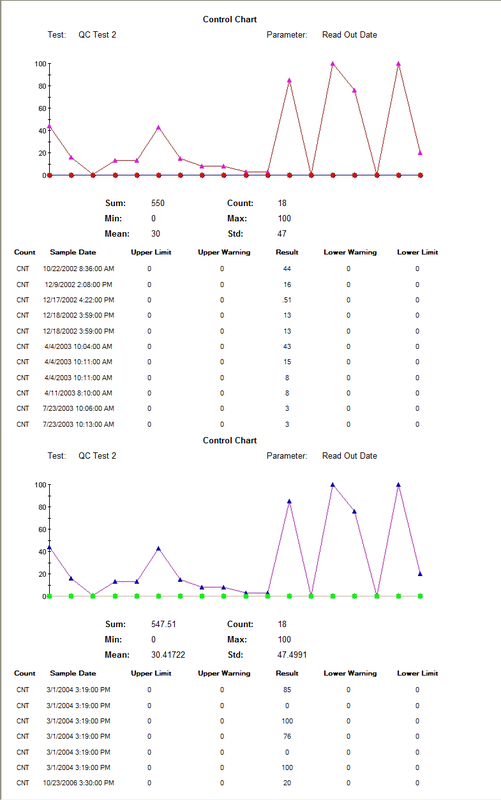 On the Control Chart Main List screen, select the data samples for which you want to display QC Limits. You may also click Select All . Click QC Limits. 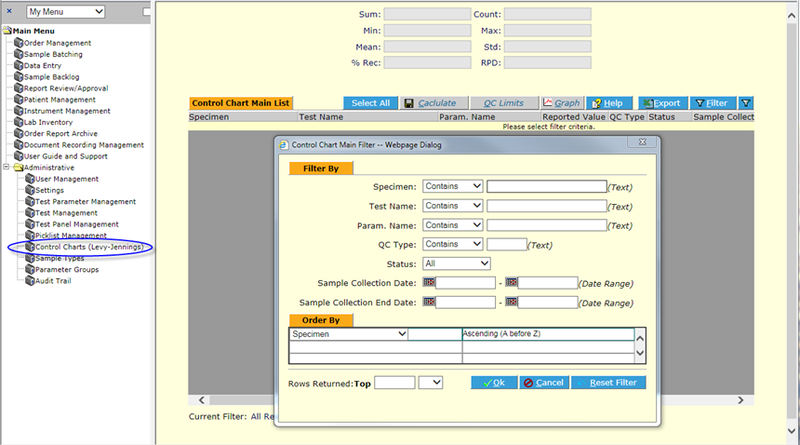 The system displays the QC Limits screen for the selected sample data. On the QC Limits screen, complete the Calculation Inputs fields, as necessary. MIN – Type the minimum calculation input. MAX – Type the maximum calculation input. SUM – Type the data sum calculation input. COUNT – Type the sample count calculation input. MEAN – Type the data mean calculation input. STD – Type the standard deviation calculation input. On the QC Limits screen, complete the Limits fields, as necessary. Lower Limit – Type the Lower Limit. Lower Warning Limit – Type the Lower Warning Limit. Upper Limit – Type the Upper Limit. Upper Warning Limit – Type the Upper Warning Limit. Click Update QC Limits. The system displays the data with the changes that were made. In the Limit Set area on the QC Limits screen, select either the new Limit Type or an existing Limit Type. Complete the fields of the Limit Set area. Limit Type – Select a limit type from the drop-down list. Operator – Select a mathematical operator from the drop-down list. Limit Value – Type the limit value. Formula – Click the link to build a formula using the Add/Edit Limit Formula web page dialog. C (Chart Limit) – Select the checkbox to include the limit in the chart output. In the Limits area on the QC Limits screen, click Graph. The system displays the graph of the selected data. In the Control Charts Main List screen, after selecting the records you wish to graph and clicking Calculate , then click the Graph button.